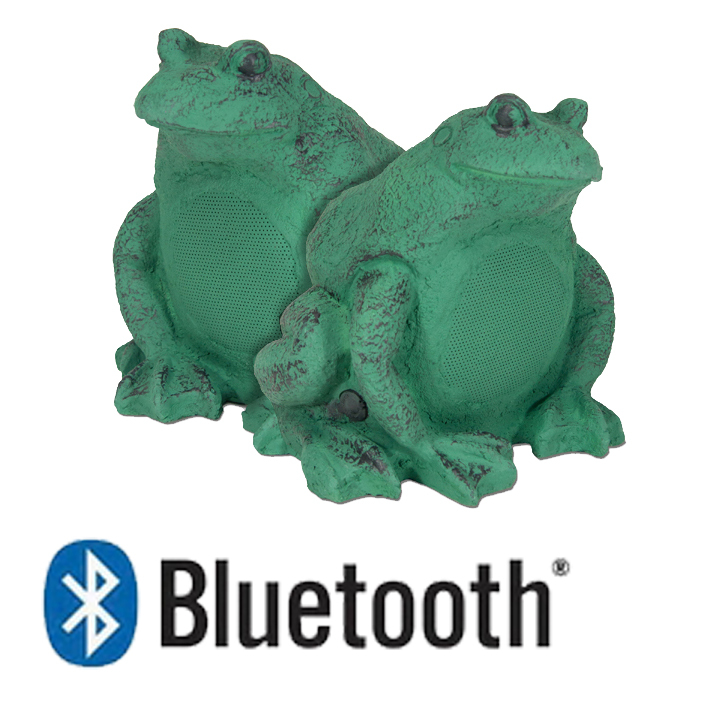 With a creative, all-weather design, the BTF-525 Wireless Bluetooth® Frog Speaker Pair gives you a great way to pipe music outdoors to your friends and family without interrupting your landscape. 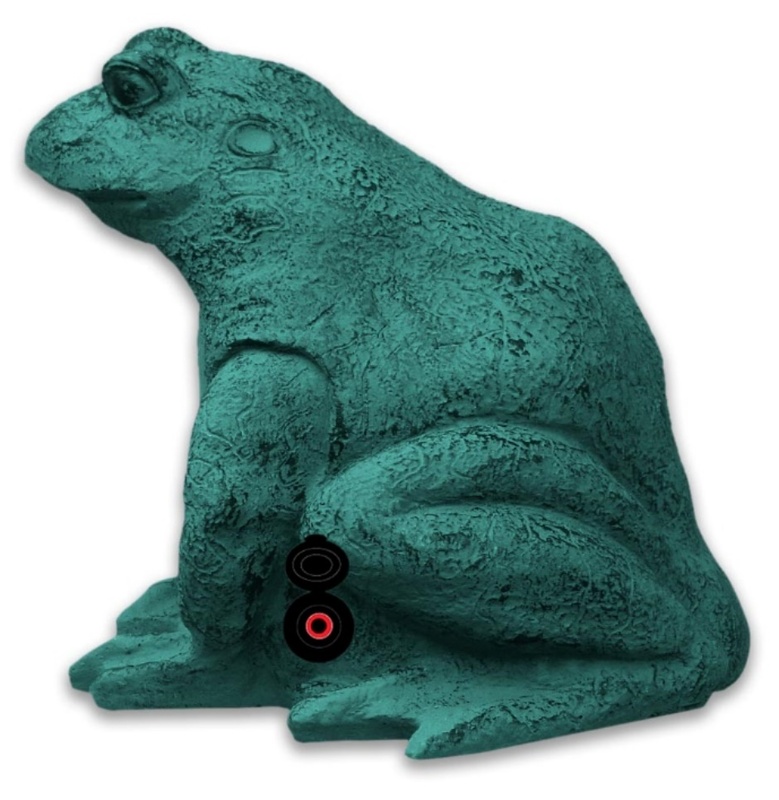 The Bluetooth® enabled device syncs up with the master Frog with the internal Stereo Amplifier and Bluetooth® Receiver. The second Frog or pairing speaker connects to the master with the 30 feet of Speaker cable supplied in the kit. 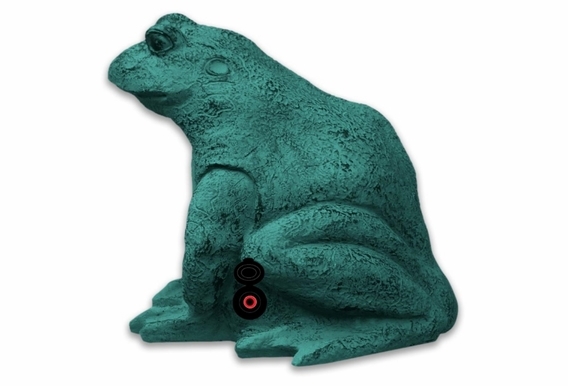 We recommend placing the frogs 8 to 12 foot apart for the best stereo right and left separation. We provide 25 feet of speaker wire just in case you have to get creative with hiding the wires and need that little extra footage. Otherwise you can cut the wire down to the exact size. The Master Frog also needs to be connected to a 110 AC outlet to power both the amplifier and Bluetooth® Receiver. 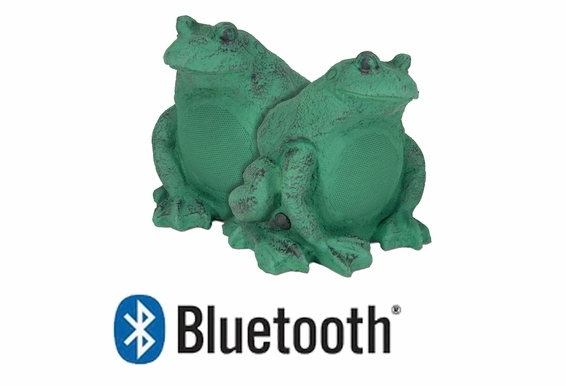 The only true wireless connection is between the Bluetooth® enabled device and the master Frog. Hi, noticed someone else needing a new power supply. Is this common? We've had our frogs for less than one year, came in to the shop yesterday and couldn't get them to play. Unplugged the power supply and inserted batteries and their playing fine now. I'm assuming this means the PS has gone out. When we first got these speakers they worked great. We found that they work better plugged in to an outlet that they do off battery power. The sound is very distorted on battery power but nice and crisp on outlet power. The main problem with these speakers is Bluetooth skipping. One day they will play fine then all of a sudden the songs will start skipping for no reason. We tried everything from putting the Bluetooth devise closer to the speakers to trying a different device. It does it with an Iphone an Ipod and a android phone. Does anyone else have this problem?? If so..How did you fix it? If its bluetooth why do I need wires? So they both run off Bluetooth. Don't need to run any wires. If I want to separate the speakers further than the recommended 13 feet apart, can I use my own speaker wire? Yes you can - please use at least 16 gauge wire for optional performance. IS there any difference between this set of frog speakers and the other, labeled as product code #bstk-btf525? Why does the description advertise 30 ft of outdoor cord, but the owner's manual includes a 13 ft cord and nothing else? How do I know if my laptop is a Bluetooth enabled device? Is it possible to use a speaker splitter in to the iPad so you can use two sets of speakers, one for outdoor speakers and the other thru another set thru the receiver? Hi Jean, Unfortunately not with Bluetooth. You are limited to running one pair per device. You could run an amplifier, wired to a couple pairs of outdoor speakers, and then connect a Bluetooth receiver to the amp. This would allow you to control the system wirelessly but you would need to run wire to the speakers. Does this order come with one or two frog speakers for the price of 129.95? what source is used in powering these speakers? Also, can the two frogs be separated or must they always be connected by a wire. Hello, The master speaker has a built-in amplifier that powers itself and the satellite speaker. An AC power supply is included that needs to plug into the main speaker from an outlet. The satellite speaker needs to be connected if you want stereo. I suppose you could not connect the satellite speaker if you didn't want to. These speakers connect via Bluetooth via a smartphone or tablet. Can you connect to a stereo receiver. Hi Tony, No. These speakers will only connect to smartphones, tablets and computers. I already have a pair that I have had for over 7 years and I want anew pair that are bluetooth. My old frogs you have to plug in your device and use the remote. Just checking that these don't have to be connected to the device correct? BTW I love my speakers, my guest after all these year love them and they have a great sound. they are mixed in with my perennial garden and they look great! Hello, With the Bluetooth speakers you'll need to connect directly from your smartphone, tablet or laptop via Bluetooth. No transmitter device is used with this technology. Glad you like them! If powered by the aa batteries how long will they last? Hi Brett, I believe the battery life while running these speakers is about 7 hours. Is the speaker pair of frogs separate? Or are they connected? What I am hoping for is they are separate so I can put on either side of my planter. Please advise. Do these speakers only connect to tablets and iphones or can they connect to bluetooth audio transmitters like the Avantree Saturn (which supports A2DP and compatible with bluetooth 2.1 + EDR)? Hi Youssef, Good question! We've never tested these with any Bluetooth receiver units yet, so it would be interesting to find out. The unit would need to be able to link to the speakers by scanning for the signal and accessing it with code. I'm not confident that it's made to work that direction. How many speakers can i add and still use one main bluetooth frog?